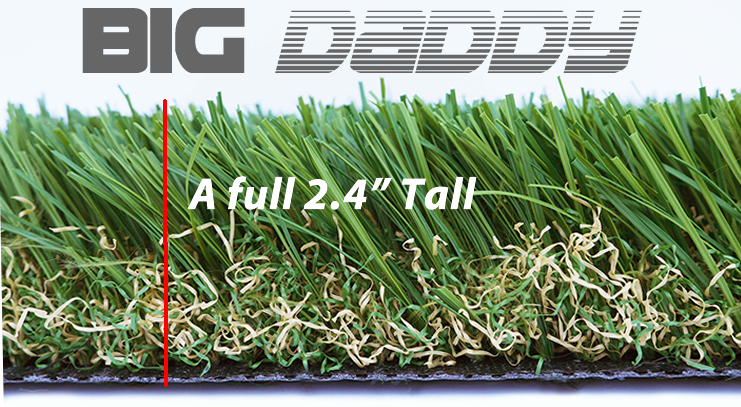 If you want the thickest, tallest turf, it’s Big Daddy! The Big Daddy is a monster of a synthetic turf option. Fully manufactured in the US, with S extrusion grass blade technology, the Big Daddy has very low sheen, that is stable and upright with a huge supportive root-zone lower structure. Big Daddy uses the cool fiber technology which helps reduce heat by reflecting and limiting the concentration of sunlight in any one given direction. BD can be used in almost any turf application, and limited only by the sheer weight of each roll. Because of the overall face weight, infill quantities can be limited, pending function of turf. We recommend turf infill depending on application.